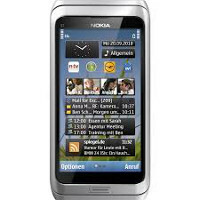 Nokia E7 business smartphone. With Microsoft Exchange ActiveSync Nokia E7 provides direct, immediate and secure access to corporate mailboxes. Your data is adequately protected by safeguards business class. Equipped with a 4-inch touch screen with polarization and a full keyboard, the Nokia E7 is also good for creating documents, spreadsheets or browse the reading and editing slides. Remember that entered PIN on the website must be exactly the same as PIN entered in the setup program on your Nokia E7.